Interested in having your commitment featured on our website? Olivia "Liv" Nguyen didn't have to look too far when deciding on her academic and soccer passions. "I have always wanted to play at Arizona State University since I was little because I grew up watching their games. Plus, there is great competition in the Pac-12. I am also very excited about their Barrett Honors Program, which will challenge me in the classroom." The Corona del Sol senior is most looking forward to, "playing in the first college game at to be a part of the team." Nguyen has only played club soccer with SC del Sol and credits them with helping her get to the next level. "SC del Sol has really shaped me into the player I am today." 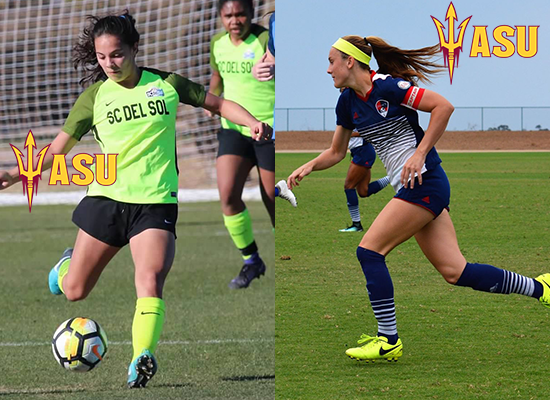 It's not often that a player is able to find a college close to their home that allows family and friends to visit so when ASU presented itself as an option, Callie Darst knew she had to go there. "I committed to ASU because I loved the program, the Pac-12 intensity, and the idea that I could have friends and family come to every game. I have grown up going to ASU soccer games, so it was really always my #1 choice." She added, "I’m looking forward to playing at such a high level and playing for my dream school. I can’t wait to be a part of the program that I’ve been looking up to since I was little." Darst, who is a junior at Hamilton has been a member of Arizona's ODP team for the past five years and played YOP one year prior to that. She currently plays for Legacy and cites them as helping her in her development. "Legacy has helped me prepare by providing quality training sessions, playing in top tournaments, and teaching us how to function in a college soccer atmosphere (travel, practices, fitness, etc)."